These nut-free Oatmeal Superfood Granola Bars are here to satisfy your mid-afternoon snack attack! So I’m definitely on a nut-free snack kick lately. 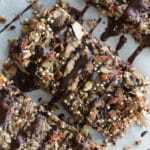 Last week, it was these Dark Chocolate Cherry Energy Bites, and this week it’s these Oatmeal Superfood Granola Bars. No worries, there will be more nutty recipes soon, but for now, I’m enjoying the seed and dried fruit combos! They’re filling and wholesome, and perfect snacks for those with nut allergies or to pack for school lunches. Well, there’s a method to my madness. While chocolate treats and fancy meals are definitely high priority for Valentine’s Day (at least for me! ), we also need some healthy snacks to get us through the day. And these Oatmeal Superfood Granola Bars are just that snack! 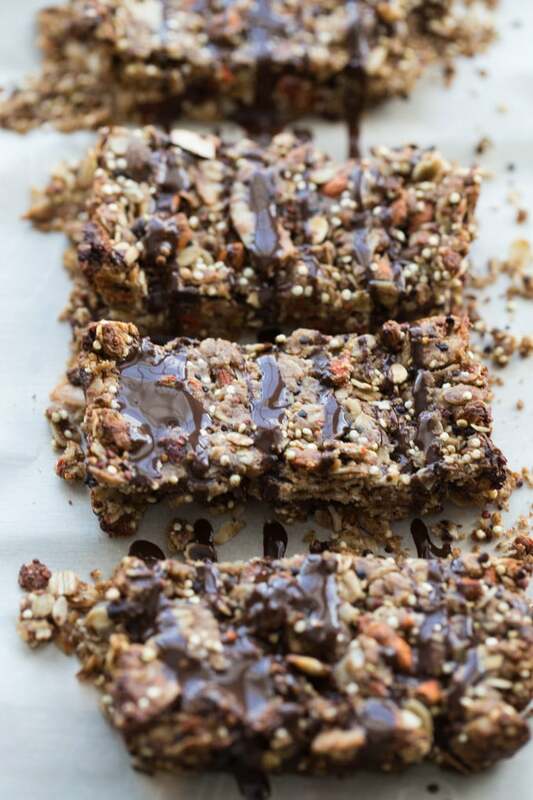 These bars are loaded with rolled oats, quinoa, goji berries, maca powder and dark chocolate. So you know they have lots of fibre and protein, and even some extra vitamins, minerals and antioxidants from the goji berries and maca. If you haven’t tried maca powder, you can find it in the organic section of your grocery or bulk food store. It contains several vitamins and minerals, including vitamin C, and has a caramel, malt-like flavour. Many people use it in smoothies and lattes, and even in baking. So given the health benefits and the flavour, I decided to add a tablespoon of it to these Oatmeal Superfood Granola Bars. If you make these bars, let me know how they turn out by taking a pic and sharing on Instagram. 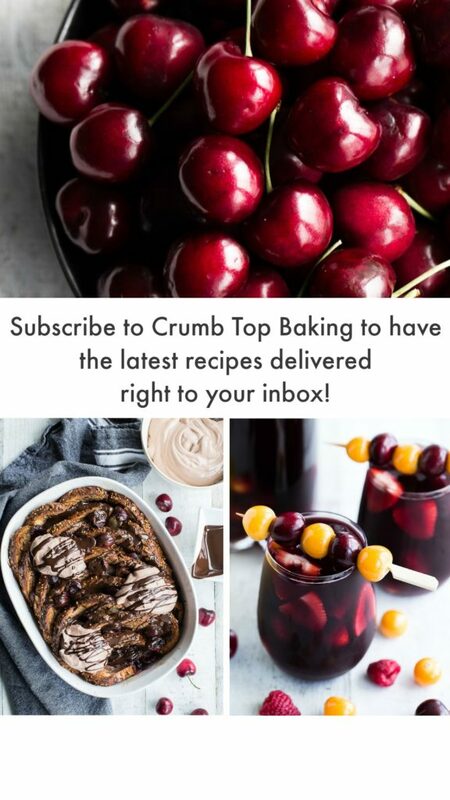 Just make sure to tag @crumbtopbaking so I’ll see it! 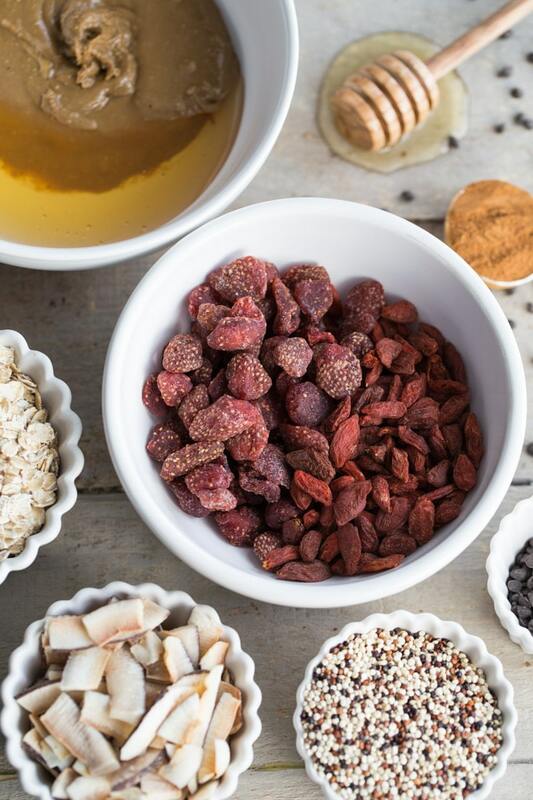 Oatmeal Superfood Granola Bars are nut-free and loaded with clean eating ingredients like rolled oats, quinoa, goji berries, maca powder and dark chocolate! Perfect for school lunches and mid-day snacks! Pre-heat oven to 350 degrees and grease a rectangular tart pan (I used 14″x4″). In a large bowl, combine the oats, quinoa, coconut, strawberries, goji berries, cinnamon, maca powder and chocolate chips. Set aside. In a medium-sized bowl, add the sunflower seed butter and honey and stir until well-combined and smooth. (You may need to microwave the mixture for 20-30 seconds so it’s soft enough to stir together). Pour the mixture over the oatmeal mixture and stir for several minutes until well combined and sticky. (If your seed butter/honey mixture is still warm from the microwave, wait a few minutes before adding it to the oatmeal mixture so the chocolate chips don’t melt). Firmly press the mixture into the prepared tart pan and bake for 12-13 minutes, or until the edges are browned. Remove from the oven and let cool in the pan for 2-3 hours, or until the granola bars have firmed up. Once firmed up, cut into 8-10 pieces. Melt the additional chocolate chips and coconut oil and drizzle over the bars. Place in the fridge until the chocolate is set. Store the bars on the counter in an airtight container and enjoy within 4-5 days, or freeze for later enjoyment! The granola bars will still be a bit soft when you remove them from the oven, but they will firm up as they cool in the pan. You should wait until they are firmed up before cutting into bars. These granola bars look like a treat, even if they are healthy! 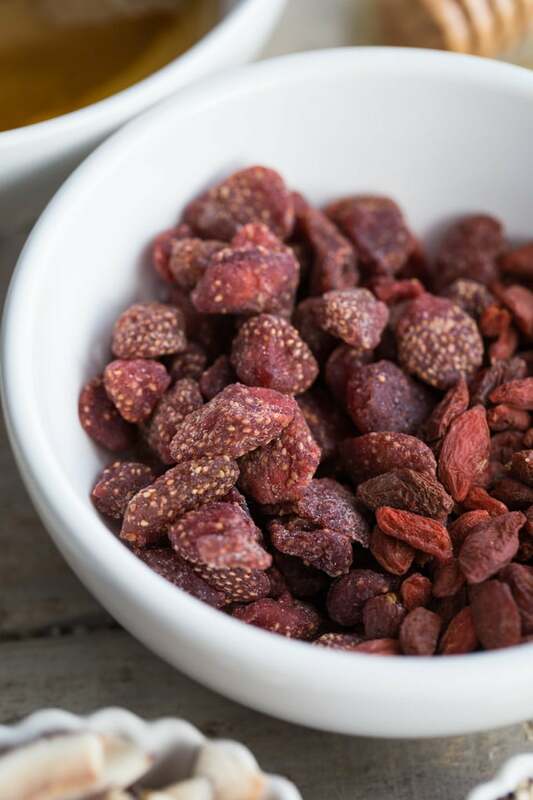 I’ve never seen dried strawberries, but what a great ingredient! Thanks Colleen! These definitely make a great mid-morning snack for work! I found the dried strawberries at Bulk Barn. They’re perfect in these granola bars. They add a nice chewy texture. Happy Sunday! 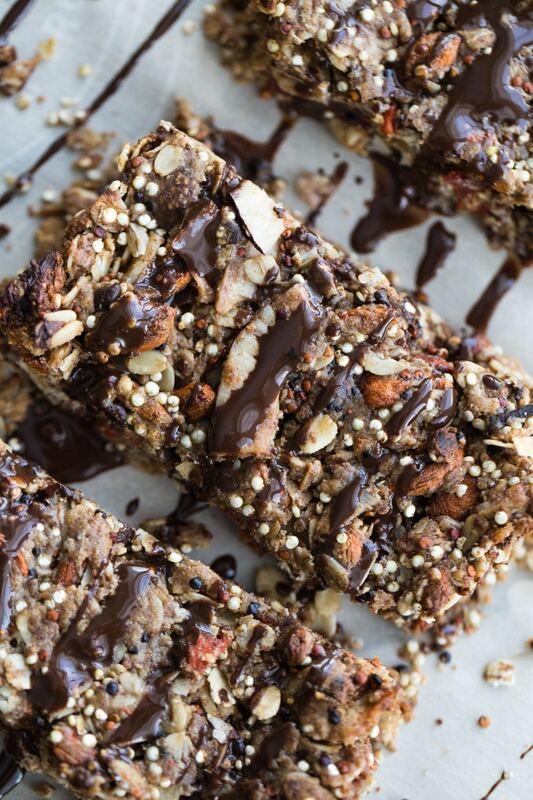 These granola bars look like a wonderfully healthy treat! I could totally see myself snacking on these for a mid morning snack at work. I’ve never had maca powder before, it sounds awesome! Thanks Vanessa! I’ve only recently started adding maca powder to recipes. So far, I think it’s a great ingredient! Tare care! Good combination of seed and dried fruits! Nice to have this oatmeal bars that are crispy without the nuts and loaded with benefits. Definitely a delicious healthy treat! Thanks Andre! Seed butter and dried fruit definitely make a great combo! Have a great week! Love love love everything in these except the strawberries (allergic). Maybe I could sub some dates or dried apricots? They just look so yummy! Thanks Lisa! I think dried apricots would work really well! Let me know if you give them a try! These are definitely up my alley!! I have never used maca powder, but you’ve convinced me to go get some to try these out!! They look terrific – and we all need a little healthiness in between all the decadence. Thanks Katherine! Maca powder is new to me too! I’ve added it to a few different recipes and really like it. Hope you like these granola bars! I am planning to start making my own granola bars and I love how healthy these are. I’m also intrigued by maca, as I’ve never heard of it or tried it. I’ll be hunting it down next time I’m at the grocery store – these look amazing! Thanks Terri! Homemade granola bars are the best! Would love to know what you think of maca powder if you give it a try. Have a great week! Absolutly love making homemade granola bars! I have a Cocoa, pistachio and cherry version on Earth, Food, and Fire!. Homemade Granola Bars are so easy to make, and the prefect snack food (for kids and adults alike!) Great recipe! Looking forward to trying a new snack bar! I love cocoa, pistachio and cherry together, and I bet that combo is great in a granola bar! Hope you get a chance to give these bars a try! Would love to know what you think! Thanks Dawn! Hope you get a chance to make them! They’ve definitely helped me change up my morning routine. Have an awesome week! Great recipe, Leanne! I honestly will be trying this as a great snack for on the go! Thanks Jen! Hope you like them! Happy Monday! They look so delicious and once again, love that you made it nut-free. So important for people with small kids going to nut-free schools. Totally on a nut-free kick HeeJee! Thanks for stopping by and checking out the recipe! 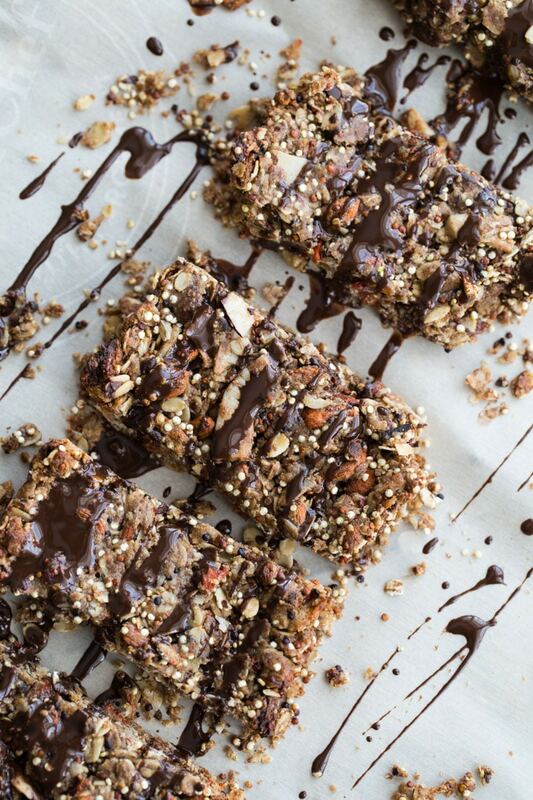 These granola bars look so decadent! Is it the chocolate drizzle? 🙂 I haven’t used the sunflower seed butter and maca powder before..But would totally love to try these!! Thanks Deepika! It’s definitely the chocolate drizzle! ;) I’ve been using sunflower seed butter a lot lately. Definitely worth a try! I was looking for a good recipe with maca. Thanks. Thanks Barb! I hope you like them! Love that there’s Maca in these! My go to for energy- definitely trying these out! That’s great. Thanks Helene! Would love to know what you think if you try them! These are just perfect for my afternoon sweet cravings. I love when I can feed that craving and still be a little healthy doing it :). Hope you’re having a great weekend, Leanne! These are definitely perfect for that afternoon sweet craving! Hope you had a nice weekend Kelsie. Happy Monday! These granola bars look so good Leanne. I absolutely love the wholesome ingredients you have combined to make these bars, but have never used maca powder before. I would definitely love to give this a try…it makes such a great and healthy snack or quick breakfast idea. Thanks Ashika! I hope you give them a try. They’re definitely a new favourite of mine! Enjoy the rest of your week! Heavenly, I love anything which has coconut and chocolate chips . Pinning!!! Already looking forward to mid-day just so I can have this snack! Love the combination of healthy and delicious flavors here! Thanks Annie! They definitely make a tasty and filling mid-morning snack. Hope you get a chance to make them! These are perfect as a post workout snack Leanne! Or for my afternoon slump. Loaded with all the good stuff! Thanks Mary Ann! Post-workout snack is a great idea! I’ve made a few crumbly granola bars too! Hope you like these! Be sure to let me know if you make them! Thanks Neha! I definitely packed a lot into these bars! And they’re certainly filling! Hope you get a chance to try them! glad you added some dark chocolate (; i’m always on the lookout for healthy snacks, but i’m not satisfied without some sugar, so these sound perfect! These granola bars seem like a perfect and easy treat which I could have almost every day, Leanne! Plus, they combine some awesome nutrient0dense ingredients which make this bars a great breakfast option! They’re definitely packed with lots of goodness Agness! Easy to make and perfect for on-the-go! Thanks for stopping by!